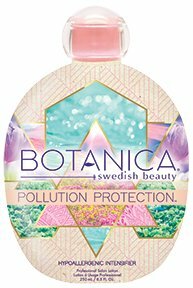 BOTANICAL INTENSIFIER by Swedish Beauty - 8.5 oz. Home/Tanning Bed Lotion /Swedish Beauty /BOTANICAL INTENSIFIER by Swedish Beauty - 8.5 oz. Every day we expose ourselves to dirt, dust and smog in the air, clogging pores and making skin appear dull and lifeless. Because of this, protecting skin from these urban pollutants is more important than ever! Fight back with this Pollution Protection™ Collection, featuring ingredients to help your skin stay bronzed and beautiful, plus a Pollution Protection™ Blend that defends against environmental stressors and fights signs of fatigue on the skin. Whether you are city chic or a suburban socialite, kick those impurities to the curb! Bring back your natural brilliance and maintain youthful, glowing skin with Swedish Beauty®.